The New York Times has finally called in the experts to explain why so many apple pies turn out so badly. 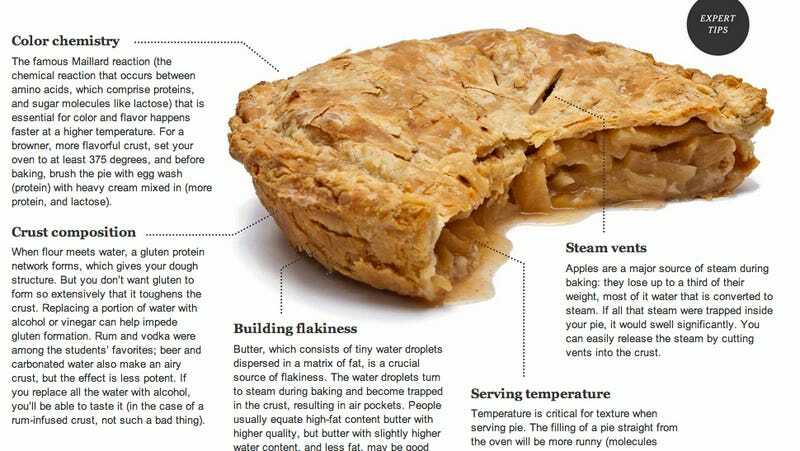 This great visualization is based on comments from Amy Rowat, a biophysicist at UCLA who teaches a class that covers the delicate science of apple pies. That might sound ludicrous to some, but it turns out that there's plenty to know, starting with the Maillard reaction, the chemical reaction between amino acid and a reducing sugar that gives the crust that perfect glow (make sure you bake over 375 degrees and brush with egg whites). Some other fascinating info nuggets include: Replacing some of the water with Rum or another alcohol will impede the formation of gluten (which toughens the crust); the tiny droplets of water that make up butter are what create air pockets in the crust; and a bit of flour will fend off runny filling, because its molecules are bigger and slower than water molecules.